The Perfect End to a Perfect Meal: A Gourmet Chocolate Bar! It all started with bacon. Next came chili peppers and beef jerky. We know, these sound like burger toppings. 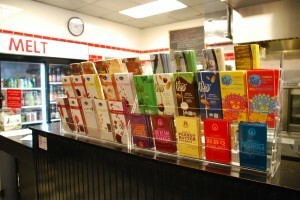 Actually they are just a sample of the unique artisan chocolate bar selection we now carry at Melt. Admit it, you’re kind of curious. Not just a novelty, some of these chocolate combinations are just crazy enough to work together. If you keep an open mind, you may find a flavor that wows your palate. We also carry more conventional pairings, so we’re bound to have a flavor you’ll love. Our chocolate is also Certified Organic and Fair Trade. Not only do these bars taste good, they’re good for the planet. At Melt, you’ll come for the burgers and stay for the chocolate. Or is it the other way around?